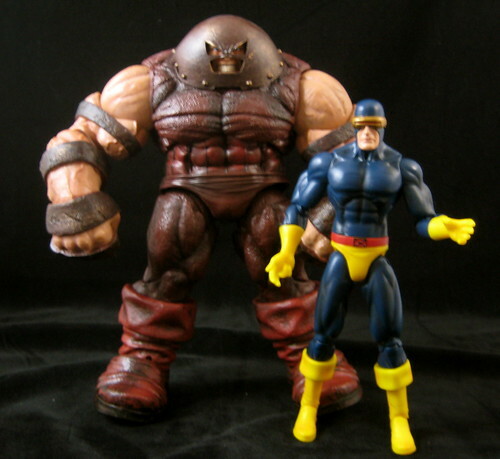 Marvel Select has continued it’s great run of X-Men related figures with their recent releases of Juggernaut and Cyclops. These are two excellent figures that are great additions to the Marvel Select Universe, which is starting to take a bit of shape after a long line of unrelated releases punctuated by movie tie-ins. Diamond has really mastered the oversized characters in the Marvel Select line, and Juggernaut is no exception to that. It doesn’t quite surpass the brilliant work done on Abomination, but it’s still an excellent piece. Size-wise, I think this figure is spot-on. He’s a perfect height compared to the regular sized characters. Articulation is pretty reasonable for a figure of this size and bulk. He has ample arm movement and rotation. Legs are a little more limited, and due to the helmet there is no head rotation. He requires a bit of handling to balance in certain positions but is overall a stable figure, not terrible difficult to pose or display. This figure features great use of texture, with different aspects of Juggernaut’s uniform, such as his helmet, boots and the leather straps of his arms and hands each given a different look, adding a great deal of life to what could otherwise have been a rather monochromatic mass at this scale. There is also excellent definition of his musculature and veins, all helping to bring the character to life in a fantastic way. This is complimented by an excellent paint job. 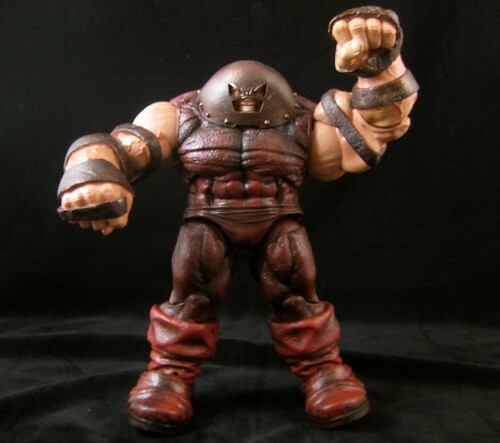 There is a variant edition of Juggernaut, which is Cain Marko sans helmet. I certainly wouldn’t have said no to a removable helmet or swappable head, but buying another gigantic figure like that just for the unmasked head will not be happening. I can’t imagine too many people would have the money or display space to spring for both. From the looks of the helmet, a removable mask may not have been possible – there isn’t a full head under there and it doesn’t look like there’s room for one. Seems an extra head could have been an easy pack-in for the money spent. 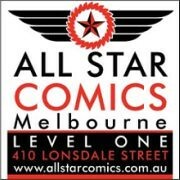 If you’re desperate for one, I’d wait awhile, as I suspect the variant editions will end up in sale bins in due course. On the other side of the coin, we have Scott Summers, better known as the X-Men’s Cyclops. The generic Marvel Select male buck has some failings, particularly the ball jointed hips and legs. This often quite ugly looking feature isn’t so bad here, as Cyclops has been designed with smaller thighs, which mean that his upper leg is all one piece. The lines of his uniform make the gap between hip and leg less obvious. This is all complimented by a very nice paint job with no visible flaws. One niggle with articulation here is that while Cyclops’ right hand is posed with two fingers extended to trigger his optic blast, but it’s actually impossible to get him completely into this pose – at least this little bunny couldn’t accomplish it. There just isn’t quite enough movement in Cyclops’ arms to make it happen. It might just me the particular piece I received, but if not it’s an odd mismatch between hand sculpt and articulation. 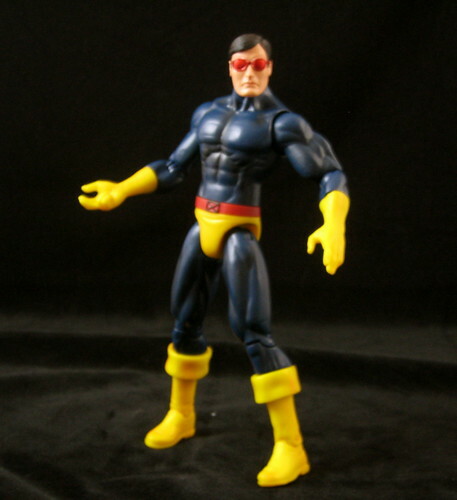 Cyclops has a variant figure, which is an X-Factor uniform version. Both come with a pack-in unmasked head with ruby quartz glasses, which I quite like. I doubt it’s intentional, but the unmasked head is very reminiscent of my favourite X-Man artist, Paul Smith. Two thumbs up, especially since unlike Juggernaut or the recently released Magneto, this extra head isn’t a variant. Cyclops also comes with a Danger Room backdrop, which has gone straight into storage as I don’t have the display space for the less than essential Marvel Select bases. It looks like the upcoming Gambit has a complimentary base, so it’s worth holding on to in case they connect and ultimately build something a bit bigger. After a huge rush of releases, we now have Gambit to look forward to, and then it looks like MS will be taken over by Thor movie tie-ins for awhile. I hope that passes quickly so that we can get back to some more fantastic comic-based releases! You can see more pics on Facebook, discuss this at the AFB Forum, and comment on this post to enter the March AFB Comment of the Month Contest! Also, don’t forget to check out the two contests we have going at the moment: the “That ‘70s Custom” Custom Contest and our first “Toy Lines!” Caption Contest! That is one evil looking Juggernaught.